In June, 2017 the Valiantes received a unanimous call from the boards of Haven of Grace Seminary and Pacific Rim Missions International to come and serve at the Seminary located just south of Bacolod, on the island of Negros in the Philippines. Haven of Grace is beautifully situated on the Pacific Ocean with a beautiful campus that is ready to house up to 100 students. The campus is currently used for summer camp ministries, and has hosted weekly modules for pastors in the past number of years, but the desire is to launch a fu lly functioning seminary to train men for the work of the ministry. For many years, Dr. Tim has had an interest in teaching, as well as missions. A year and half ago he learned of the need for a teacher at Haven of Grace through Evangelist Mark Kittrell (director of PRMI). Although his interest in the ministry was initially piqued, he wanted to make sure this was something the Lord was bringing about so he decided to wait at least six months before inquiring about it. After waiting over six months, he found that his interest in this ministry had only intensified. After contacting Brother Mark, a meeting was arranged to discuss whether Dr. Tim would be a potential fit in this ministry. During this meeting, Dr. Tim found that he shared a very similar philosophy of ministry as well as theological positions as Mark and PRMI. At this point, a decision was made for Dr. Tim to visit the Philippines as he and his family sought the Lord’s leading for their lives. While in the Philippines, Dr. Tim felt very much at home and found a vibrant, thriving work being accomplished in and around the city of Bacolod. He also heard from numerous pastors of the great need for further education. Seminary level education is simply not accessible in the surrounding region. While on this trip, Dr. Tim noted the viability and necessity of a strong, conservative, theologically sound seminary to serve not just the Western Visayas, but the whole region of Southeastern Asia. 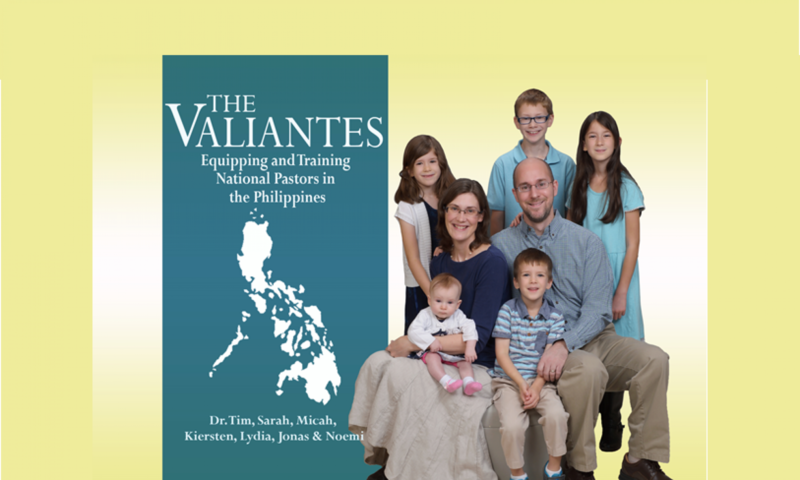 The Valiantes are excited to be a part of the formation of this vital ministry. They trust that the Lord will lead them in His time to begin serving Him in this field.